This is something that took me several years to actually figure out. Through trial and error (lots and lots of error), and learning from the right people, I've finally realized how to get those gorgeous spring blooms here in Northern California! I'm in zone 9b so what I'm about to tell you applies to this particular climate, and maybe zone 8, so you'll have to apply your own knowledge to your particular zone. You need to plant your spring flower transplants in the FALL, which means you need to sow your seeds in the SUMMER. I know it feels so weird to be thinking about spring in the height of the summer when you are swamped with flowers to harvest, but as a farmer, we always have to be thinking a couple seasons ahead! As a good rule of thumb, the best time to order spring bulbs is right after they finish flowering. So generally, you want to be placing your orders for ranunculus, anemones, tulips, etc, in early May (and they'll get shipped in fall). So, order your seeds at the end of spring. Sow seeds near the end of summer for planting in fall. If fall rolls around, and you've just started to think about spring, you're already too late. I'm sorry. I've done this year after year and have learned the hard way. I've sown spring seeds in fall and try to plant them out early in the new year, and they just suffer. The soil is too cold by this time and frost might kill them if not properly protected. With the short daylight hours, the plants don't grow as "beefy" as they should be and by the time March rolls around, they'll start sending up stems, but from a wimpy base. The stems will be short. The heat will come on fast and fry your wimpy spring flowers. It's pretty deflating. But don't worry, we just need to adjust our timing for success! Here's the thing you need to realize: Spring flowers are COOL FLOWERS meaning they like to do the bulk of their growing during the winter. However, as transplants, they like warm soil (around 70 degrees) to get established in. If you sow your seeds in July or August, you should be ready to transplant your spring babies in late September or October. This year, I got all my spring plants in by mid-october. This is also an optimal time to plant bulbs. Some plants do well directly sown, or scattered in the fall. I have had a lot of luck with larkspur and nigella this way. Bells of Ireland and sweet peas have re-sown themselves in the fall. In general though, direct seeding is such a gamble so I like to plan for having transplants. Some cool flowers are so hardy, that they won't need protection from light frosts. This includes larkspur, stock, bachelors buttons, foxglove, sweet peas, ranunculus, and probably many more I'm not listing. I tend to error on the side of caution and cover everything anyways, with a light weight agribond/frost blanket. Where I farm, the winds come ripping through and that can be really damaging to plants. So, the agribond helps for diminishing the wind impact as well as keeping out rodents who will dig at my bulbs from above ground. This year, it's almost March, and we've gotten a few harder frosts. 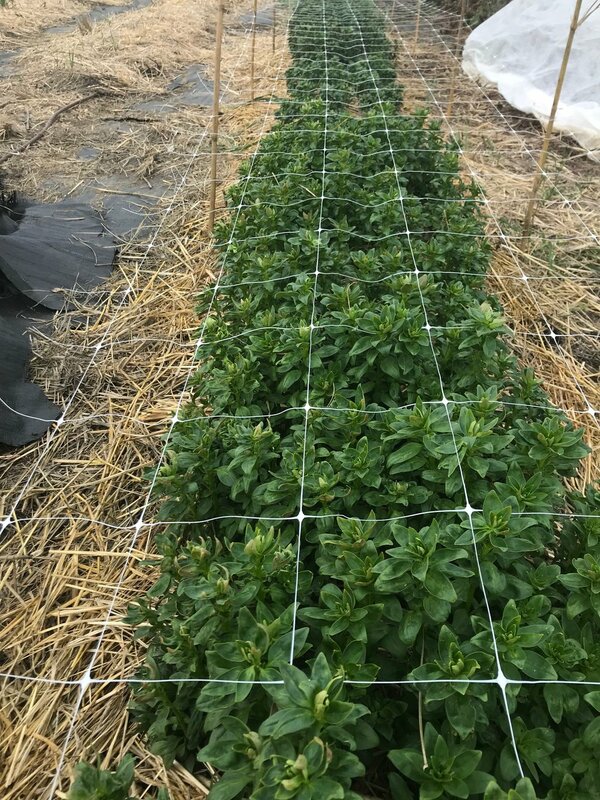 Luckily, my plants have all been fine in their tunnels of agribond, but using plastic instead of frost blanket would help ensure their protection even more-so when frosts in the mid-20's are in the forecast. The time that spring plants are most susceptible to damage from frost is when they've started to send up stems and grow buds. Growers in colder climates will also plant their spring flowers in the fall, to get a jump on the spring season, but instead of covering with agribond, they cover with plastic. They'll make low tunnels with plastic, and will need to vent these on warm days. For really hard frosts in a cold climate, they'll lay agribond over their plants within their plastic tunnels. So that's it, growers. The trick to having gorgeous spring flowers is just all about timing, getting them planted in the fall, and then protecting them from frost as necessary. There is a book out there that revolutionized this concept for me and really helped me get a grasp on how to grow beautiful spring flowers. That book is called Cool Flowers by Lisa Mason Ziegler. You can find it HERE on her website, and I highly recommend it!